Hyping Obama in the "battleground state" of North Carolina, BooneOakley has launched a guerrilla campaign. 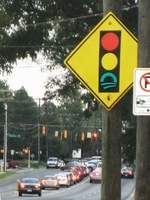 The agency printed decals of the Obama sunrise logo, each, at a diameter of 9.25 inches, sized perfectly to fit over the green circle in a stoplight sign. Of course, it's all supposed to mean "GObama." As of this week, the decals have begun to appear on street signs throughout the states of North Carolina and neighboring Georgia and Virginia, placed by agency staff and by friends. Additional decals are available at no charge from GObamaNC.com. Not overly concerned with the potential illegalities of such a stunt, BooneOakley President david Oakley said, "Well, it's not like we're putting them on actual stoplights. We don't even know anyone with an SUV tall enough to reach that high."